A Rocori High School student who received e-mails from Jason McLaughlin took the stand in McLaughlin's murder trial on Friday. Prosecutors presented several e-mails that they say show McLaughlin was planning something violent at his school leading up to the fall of 2003. St. Cloud, Minn. — A 16-year-old Rocori High school student who said Jason McLaughlin was her friend sobbed as she described the electronic messages she got from the boy. Brittany Kelley said at first things were fine. But then McLaughlin asked her if his girlfriend, who he called Suki Ranoko, could send her e-mails. 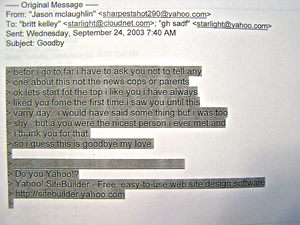 After a few of these e-mails Kelley said she realized they were from a fictitious character, created by McLaughlin. Some of the e-mails made Kelley uncomfortable; one asked her to describe her bra. The e-mails portrayed McLaughlin as a tough kid that got into a lot of fights. Kelley said she didn't want to question McLaughlin about the e-mails, because she was afraid she'd embarrass him. McLaughlin's last e-mail arrived on the morning of the shooting. Kelley didn't get it until later in the day. It said McLaughlin had something big planned, but warned her not to tell anyone about it. McLaughlin's e-mail address at this time was Sharpestshot290. McLaughlin is accused of shooting two students that day, Aaron Rollins and Seth Bartell. Both students died. Prosecuting attorneys have said these e-mails are some of the evidence that McLaughlin planned a murder at school, weeks -- maybe months -- in advance. His defense attorney says it merely shows that McLaughlin was starting to suffer from a mental illness, and the fake girlfriend character he created showed he was delusional. Seth Bartell's mother took the witness stand. Kim Bartell's husband, son, and daughter wept during her emotional testimony. She described her son's childhood, how it felt to find out he'd been shot at school, and what they went through while he spent over two weeks in a coma before dying. Kim Bartell said her son never mentioned Jason McLaughlin's name. McLaughlin's attorney has said he was picked on by several students, Bartell being one of them. Throughout the trial, witnesses have said McLaughlin was picked on occasionally, but it was nothing that struck them as out of the ordinary. Judge Michael Kirk recessed the court early on Friday so he could visit the crime scene. Kirk was given a first-hand tour of Rocori High School from Superintendent Scott Staska. The first phase of the trial is nearing its end. The state should finish its case on Tuesday with closing arguments that same day. Judge Kirk may announce whether McLaughlin is guilty of any or all the charges against him on Wednesday. The next phase of the trial is expected to start on July 18; at that point McLaughllin's mental state during the shooting will be taken into consideration if he is convicted.